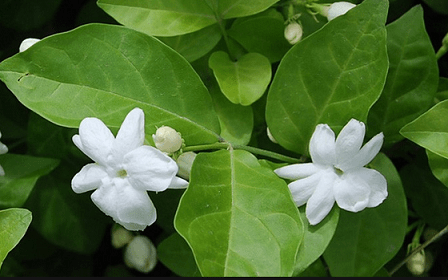 Mogra (Jasminum sambac) complete detail – updated. 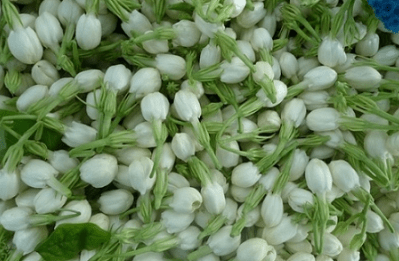 Traditional and Medicinal uses of Mogra (Jasminum sambac). Description of Mogra (Jasminum sambac). 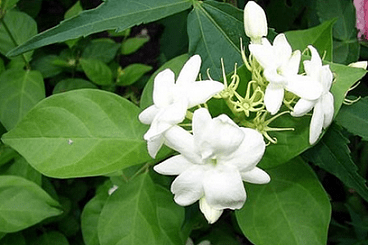 Classification of Mogra (Jasminum sambac). The dried flowers of Jasminum sambac are used by the Chinese to flavor jasmine tea. Oil is used for making perfumes, creams, shampoos, soaps and incense. Jasminum sambac is a scrambling shrub, which can grow up to 3 meters. Jasminum sambac has been commonly cultivated as an ornamental plant throughout the world. Local name of Jasminum sambac is Mogra. Distribution of Jasminum sambac. 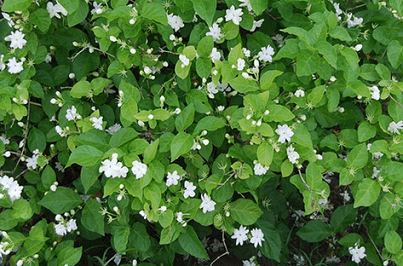 Jasmine plant is found in almost all the parts of India. Jasminum sambac is a scrambling shrub, which can grow up to 3 meters. Jasminum sambac has been commonly cultivated as an ornamental plant throughout the world. The stems of this shrubby, evergreen, twining vine are clad in glossy, dark green, pointed, oval leaves which are grouped in opposite pairs or whorls of three. Leaves are shiny dark green. Some of the evergreen leaves are in whorls of three and others are in opposite pairs. The intensely fragrant, white, waxy flowers resemble miniature gardenias and appear in clusters, although each flower is only about 1 cm in size. Jasmine blooms throughout the summer – and almost continuously in warm climates. The fruits are small black berries, but are seldom formed in cultivation. Jasminum sambac is native to southern Asia, in India, Myanmar and Sri Lanka. Jasmine plant is found in almost all the parts of India. Jasminum sambac has many medicinal properties like anti-depressant, antiseptic, cicatrisant, aphrodisiac, expectorant, anti-spasmodic, galactogogue, sedative, parturient, uterine etc. The Jasminum sambac flower is used for removing intestinal worms and is also used for jaundice and venereal diseases. The flower buds are useful in treating ulcers, vesicles, boils, skin diseases and eye disorders. The leaves extracts against breast tumours. The leaves are antiseptic and are useful for wounds or acne when used as a poultice. Drinking Jasmine tea regularly helps in curing cancer. The dried flowers of Jasminum sambac are used by the Chinese to flavor jasmine tea. Jasmine tea is most commonly consumed with or after meals as a digestive aid. Jasminum sambac oil is used for making perfumes, creams, shampoos, soaps and incense. Its flowers are used to flavor Jasmine tea and other herbal or black tea. In India Jasmine flowers are stringed together to make garlands. Jasminum sambac has been cultivated for many centuries as an ornamental plant.